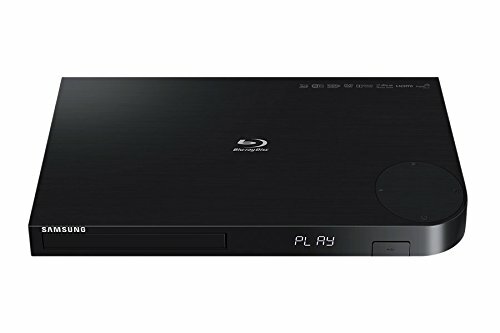 Samsung BD-J6300 / BD-JM63/ZA 3D Smart Blu-ray disc player with 4K UHD upscaling capabilities delivers the ultimate entertainment solution for those looking for the best in home-entertainment. Immerse yourself into the action with stunning lifelike detail in 4K UHD picture quality. Go Beyond High Definition: Brings images to life through its unique 4K up-scaling* capabilities to create a true cinema-like picture* 4K up-scaling provides greater detail and picture clarity by analyzing each moving frame to transform your picture to near-UHD quality** Smart Entertainment: Enjoy the benefits of a Smart TV with the BD-J6300 / BD-JM63/ZA Blu-ray Disc player with endless access to entertainment. Re-engineered user interface allows for improved ease of use Immersive 3D Entertainment: Enjoy an immersive and vivid viewing experience with Full HD 3D Blu-ray technology. Active 3D technology adds greater detail and brings images to life.